If you want distortion HoRNet Graffio gives you plenty. Graffio is a three band distortion unit with selectable crossover frequency and three different processors for each band: a saturator, an exciter and a bit reducer. Each of the processor adds a different kind of distortion to your signal, each of the flavors can be mixed with each other or bypassed, each band level is fully adjustable. High quality processing is guaranteed by the same 4x oversampling algorithm found in HoRNet Magnus. Of course if you want to distort the whole signal, Graffio works in full band mode too disabling the crossover and the high and low frequencies processors. The saturator module emulates the classic transistor distortion, an offset control allows for even harmonics generation and a warmer sound. 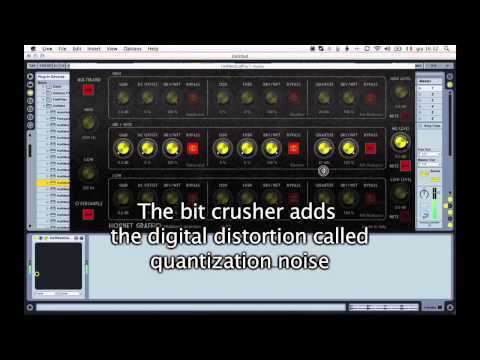 The bit reducer emulates the typical distortion of low quality digital equipment, it’s a modern and robotic distortion, useful if you want very noisy sounds. Three band crossover with adjustable frequencies. Multi band and full band operation. Three different distortion processors for each band. Dry/Wet knob and bypass for each distortion processors. Output level and mute option for each band. Audio Units VST2.4, VST3 and RTAS format. I don't know how people are not talking much about this unit on the forums out there. All I can say is I love this unit. It has been serving me very well. Thanks again Hornet. Love the sound – but the UI is counter-logic: When the light is switch on, the effect is off. Fantastic on bass guitar. A little distortion on the lows and heavy on the mids/highs for a distorted bass guitar that still has bottom. All on one track. Really useful tool. Took a bit to get used to the bypass "on" switch but a great plugin. Thanks! The saturation feature, along with the adjustable frequency cutoff points and wet/dry controls for each frequency range, make this a good alternative for bass enhancement plugins when used in moderation. I've already found it useful for helping both kick and synth bass parts cut through the mix and have a bit more thickness and "thump." Thanks!